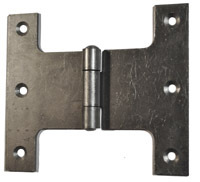 Strong steel parliament hinges for internal or external doors that have to be open up to 180 degrees bypassing any architrave, however as these particular parliament hinges have no weather-proof coating they would need painting if used on a entrance door. Please note though that as the hinge knuckle is positioned further out from a conventional hinge it allows the door to be opened so much wider and as such this means the door cannot be a tight fit to the frame on the side opposite the hinges as it would cause the door to bind. 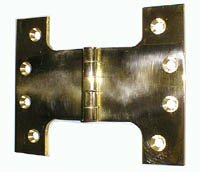 These heavy parliament hinges are used on internal or external doors that have to be open up to 180 degrees bypassing any architrave. Both finishes are highly polished and lacquered for good weather-proofing out of doors on a entrance door. The knuckle on the H092B bigger brass type allows for even greater flexibilty when used with a thicker door frame.